Part of Southbank Centre, the Royal Festival Hall is one of the finest concert venues in London. Able to seat 2,500 people, it is the first post-war building in the city to receive Grade I listed status. In fact, it’s partly because of the war that it was even built. South Bank was an area of London hit hard by the London Blitz and was in need of revitalisation after the war. The Royal Society of the Arts knew that it wanted to host an exhibition to commemorate the Great Exhibition of 1851 and the government ultimately picked South Bank to be the festival’s chief location. The Royal Festival Hall was to be a centrepiece of the Festival of Britain, a large performance venue specifically for the arts and presentations. London County Council’s chief architect, Robert Matthew, ultimately tapped Leslie Martin to design the building. Martin’s team also included Edwin Williams, Peter Moro, and the husband and wife duo of Robin and Lucienne Day. They decided that the building would eschew the classicism of the past. The foyers would have meeting spaces, restaurants, and bars without barriers to allow patrons of all classes to mix freely. They would also act as a buffer between the hall and the railway bridge to keep the train noise from disrupting concerts. The exterior was a bold white to make it shine in the bleakness of the post-war city as a sign that it would rise again. Clement Atlee laid the foundation stone for the hall in October 1949 and construction took eighteen months and roughly £2 million to complete. It opened on 3 May 1951 and counted King George VI and Queen Elizabeth amongst its inaugural attendees. The original seating capacity was around 2,900 people who were treated to a collection of British music including Elgar, Purcell, Williams, and even Handel. The following week saw concerts from the BBC Symphony Orchestra, the London Philharmonic Orchestra, the London Mozart Players, and the London Symphony Orchestra. Eight million visitors came to the Festival of Britain, but when the Conservatives returned to power in October that same year, they shut down nearly everything but the hall, with the festival being seen as something of an overindulgent Labour project. The hall used scientific principles in its design and was one of the first to do so, but the use of theoretical and experimental acoustic science had some drawbacks. While the hall was built to project sound outward into the audience, oftentimes performers had trouble hearing each other on stage. The original plywood overstage canopy was replaced with adjustable fabric reflectors, which reflected sound back onto the stage first for the benefit of performers. The original seats were later remodeled as well, which reduced the seating count to its present 2,500. Additional remodeling was done in 1964 and in 2007 to the facade, foyers, and terraces that removed some of the more aesthetically troublesome aspects of the Days’ original designs while further attuning the acoustics inside the hall. 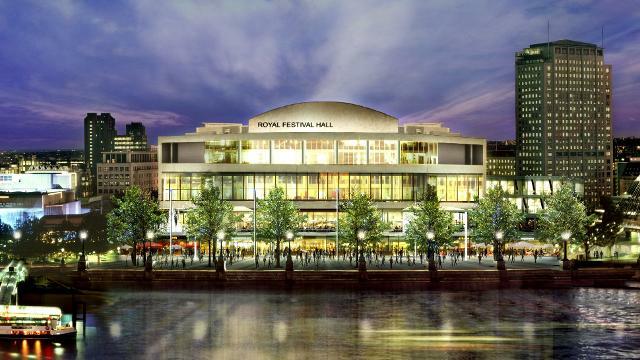 Up until the 1980s, the Royal Festival Hall was a ticket-only venue, meaning that even when a concert was not scheduled, the building was closed to the public. However, the patrons had a change of heart and, inspired by the original spirit of the building, opened it once again to visitors. The hall is open every day (except Christmas) from 10AM to 11PM and anyone can visit the foyers without a ticket. There are also many other parts of the hall such as the Poetry Library and the Archive Studio whose access varies. Built to celebrate the arts and give the public access to great work, the Royal Festival Hall continues to delight every day.